What’s the right Gas Pool Heater for you? We cover a few of the great options for inground and above-ground swimming pools in this article. Also, you should also consider a heat pump as an alternative. We touch upon heat pumps in this article but for a full analysis read our review of the Hayward HeatPro Heat Pump. Let’s start dissecting the advantages and disadvantages of gas pool heaters. Having a pool can add great value to a home and provides fun-filled enjoyment for the whole family. Accessories can further add to the value of a pool like a pool heater. These provide an added luxury to make your swimming experience even more enjoyable by eliminating the chill factor when you first get into the pool. For homeowners with a pool in Northern parts of the country, it’s not just an added benefit but a necessity for ‘winterizing’ the pool. Pool heaters are much more affordable than they used to be with added features that make them more energy-efficient and cost effective. Adding one to your pool can allow you to get more use out of it by extending the ‘swimming season’ long past summer time. There are many different types of pool heaters and heat pumps to choose from with many variables including cost factor, efficiency and durability. Before purchasing one it’s important to understand the differences between these different types. Some types provide better energy-efficiency overall while others have a lower upfront cost. This guide will provide the benefits and disadvantages of each type of heating system with our recommendation for the best pool heaters overall to consider. How Do Pool Heaters and Heat Pumps Work? Gas heaters are the most effective pool heaters around because they work to heat the pool regardless of the weather outside. They use natural gas or propane as fuel and transfer the energy generated by combustion towards heating the pool water. If your house has a natural gas line connectivity, a professional can set up the pool heating system with the gas line directly. However, if you don’t have a household gas line, a standalone portable propane tank can be used to fuel the gas heater as well. A heat pump or electric pump offers the most energy efficiency in pool heaters by using the outside air to heat the pool rather than using a fuel source. This has its pros and cons in and of itself. 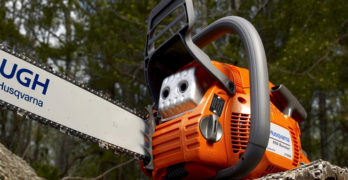 On the one hand, you don’t have to worry about connecting to a gas line or tank. On the other hand, these are only effective as long as the weather or outside air is permitting. In order for these to work effectively to heat up the pool, outside temperatures must be at least 55-degrees Fahrenheit or higher. In regions where it’s cooler through most of the year, this may not be effective. Extremely energy efficient. Cheaper to operate than gas pool heaters. Learn more about pool heat pumps in our comprehensive article on the subject. If you’re not familiar on how they work and/or their advantages and disadvantages then I think you’ll find the article useful in helping you determine if a heat pump is the right choice for you. With a sharp decline in natural gas prices, gas pool heaters are in high demand. They offer the fastest results and they’re available much cheaper than their electric or solar counterparts. Most models for gas pool heaters fall in the price range of $1,000 – $3,000. With infrequent usage, on average you might expect to pay anywhere between $500 – $1,000 annually for fuel refills to heat a medium-sized pool. However, those who live in areas where it is cold throughout most of the year will pay more for operating their heaters as it will typically have a higher fuel consumption. Set your temperature digitally to increments of 1-Degree. Gas pool heaters are inexpensive to purchase when compared to the upfront cost of an electric heater or pump. While most gas pool heaters run less than $1,500 on average, electric pumps can cost anywhere between $2,000 – $5,000. As for efficiency, electric pool heaters take much longer to heat up an average sized pool in comparison to gas. If you have a large sized pool, expect to wait a while before taking a dip with an electric heat pump. Gas pool heaters are also cheaper to install by professionals than electric. The average cost for installing a gas pool heater including the labor and materials is around $300 – $500. An electric pool heater can run you twice or even three times that amount to install due to the extent of the configurations which are required for installation. One drawback to gas heaters, however, is that they are not as great for the environment as electric. Much like any unit that runs on gas, a gas-fueled pool heater emits harmful gases when in use, while electric heat pumps produce zero emissions. In certain areas, such as California, gas pool heaters with high emissions may be prohibited to protect air quality. With that being said, there are many gas models including natural gas that are now being designed thanks to advancements in technology to emit fewer emissions in order to meet the standard regulations that control air quality. With proper maintenance and use both gas pumps and electric heaters have long-lasting capabilities. A gas pool heater has an average lifespan of 5 to 10 years. An electric heat pump does have an edge with an average lifespan of up to 15 years, providing a better long-term value. What to Look for in a Pool Heater? There are important factors you should consider when purchasing a pool heater to ensure you are getting the right heater for your needs. Pool Size – Most pool heaters will specify what pool size they are capable of heating. Using a pool heater that is too small for a pool will end up consuming too much fuel and still not provide efficient heating. Additionally, you should also look for the BTU (British Thermal Units) rating when choosing a particular model. For instance, 1 BTU signifies that the pool heater is capable of heating 1 lb of water to 1 degree Fahrenheit.) The greater BTU rating a heater has, the faster and more efficient it will prove to be at heating. 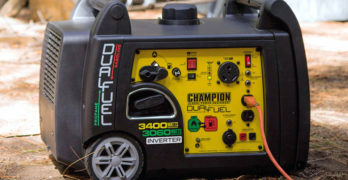 Fuel Type – The common types available are – Electric, Solar, Natural Gas and Propane. The region where your pool is located that you wish to buy the heater for will play a large factor in determining which type is most suitable. If you require frequent use from your pool, propane and natural gas pool heaters are your best choice. Likewise, if you live in area that is typically cooler throughout the year with harsh winters, gas is the only option to maintain the temperature of your pool to keep it from freezing. Pentair MasterTemp control panel. Simple and easy to use. If you live an area with a warmer climate that gets abundant sunlight through most of the year, solar pool heaters or electric heat pumps might work best for you (provided they satisfy other criteria such as fast heating and supported pool size). Control Panel – A control panel helps you adjust the temperature effectively and removes the need for an external thermometer to measure the temperature of water. It can be digital or analog in some models while some cheaper ones might not even have one. Some models additionally have useful features that automatically maintain the temperature of the water consistently or have alerts to indicate a problem or malfunction of the heater. Below is our picks for gas pool heaters for inground and above-ground swimming pools. one-piece copper header/ heat exchanger provides for leak-free performance. This propane pool heater is suitable for small to medium-sized above ground pools and spas that are less than 450 sq ft in area. 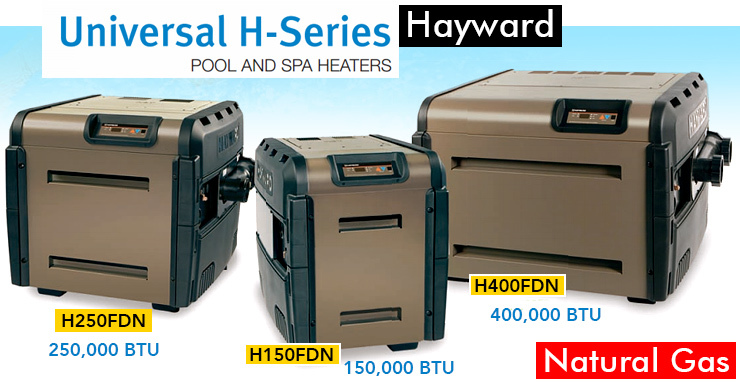 With an energy efficiency of 81%, the Hayward H100IDP1 can heat a pool up to around 85 degrees within a few hours. It features unique induced draft technology for optimal heating and efficient performance as well as automatic operation in any weather condition. Additional features include an on/off switch for convenience in maintaining a consistent temperature, a cool-to-the-touch feature for safety, and designed to produce fewer emissions so it’s better for the environment. It also has a lightweight and compact design. The Hayward H100IDP1 is the natural gas alternative to the model mentioned above. It offers similar features with the same induced draft technology for optimal performance and efficiency to heat above ground pools less than 450 sq feet in size. Due to its natural gas fuel source, it does have a lower price tag than its propane counterpart as well as lower cost of operation over time. The H100IDP1 (Propane) and the H100ID1 (Natural Gas) share all of the same features except for the gas type. I wish they made their names more distinct as it’s easy to get them confused. Maybe they should come up with catchier names so people can actually remember them. The Natural Gas and Propane models are identical. This pool and hot tub heater is available in natural gas and propane fuel type models. It features a polymer header that guarantees a superior hydraulic performance, which translates to less energy consumption. 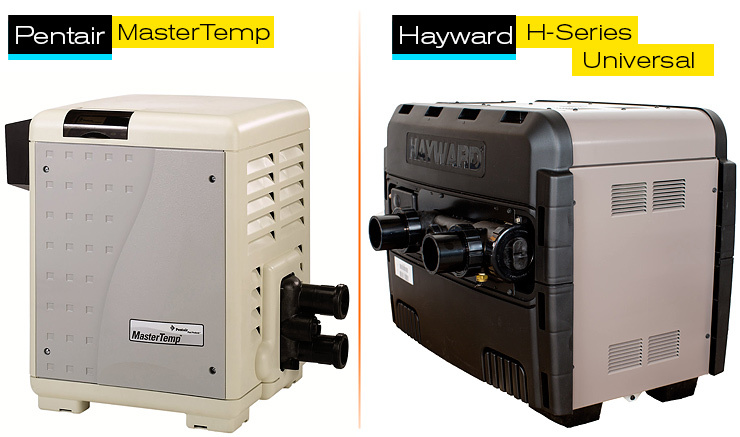 The Hayward Universal H-Series pool heater is environmentally friendly and meets current air quality standards of most US states. It delivers fast heating for large sized pools (increases the temperature by as much as 30 degrees up to 800 gallons within an hour). The universal design makes it suitable for new as well as existing installations. Not much to look at but reliable and powerful. Additional features Hayward H-series gas pool heaters offer include an LED control panel to indicate water temperature and alert problems, a forced draft combustion system and Cupro Nickel heat exchangers. This offers a unique advantage for a long-lasting quality over traditional copper because they provide corrosion-resistance that works with any water chemistry conditions. Read our in-depth review of the Hayward H-Series gas pool heaters. We’ve also covered it extensively in our article on Above Ground Pool Heaters. Sta-Rite SR200LP | 200,000 BTU | Heats up to 400 sq.ft. Sta-Rite SR333LP | 333,000 BTU | Heats up to 700 sq.ft. Sta-Rite SR400LP | 400,000 BTU | Heats up to 1200 sq.ft. This propane pool heater offers the lightest and most compact design in pool heaters but comes loaded with plenty of features. With an energy efficiency rating of 84%, it also ranks number one among other gas heaters in the same price range. The eco-friendly design is certified for low NOx emissions and suitable for indoor and outdoor in-ground pools and spas. Additional features include a large LED temperature readout, user-friendly thermostat controls that monitor and adjust water temp, and a completely weather-proof housing. Read our in-depth review of the Sta-Rite Max-E-Therm gas pool heater series. Timeless design and proven reliability make this a great option. This gas pool heater is available in natural gas and propane models that are perfect for those looking for a heater with an easy and quiet operation. It features a corrosion-proof body, compact design and the PMG combustion technology that provides an impressive 84% energy efficiency rating. There is a rotating digital display along with LED indicator lights to enable easy, smooth operation. However, the most impressive feature is the Auto-Shut Off design that shuts down the heater when the water reaches the maximum temperature or if the water pump malfunctions. It also features a manual gas shut off for when it’s being serviced. It is also certified for low NOx emissions for an environmentally friendly feature. With newer features that offer better cost efficiency and environmental-friendly configurations, gas pool heaters will give you more of an advantage among the different varieties in pool heater types. If you want to get the most use of your pool year-round the gas heaters are the way to go. Read our in-depth review on the Pentair MasterTemp gas pool heater. We’ve also covered it extensively in our article on Above Ground Pool Heaters.